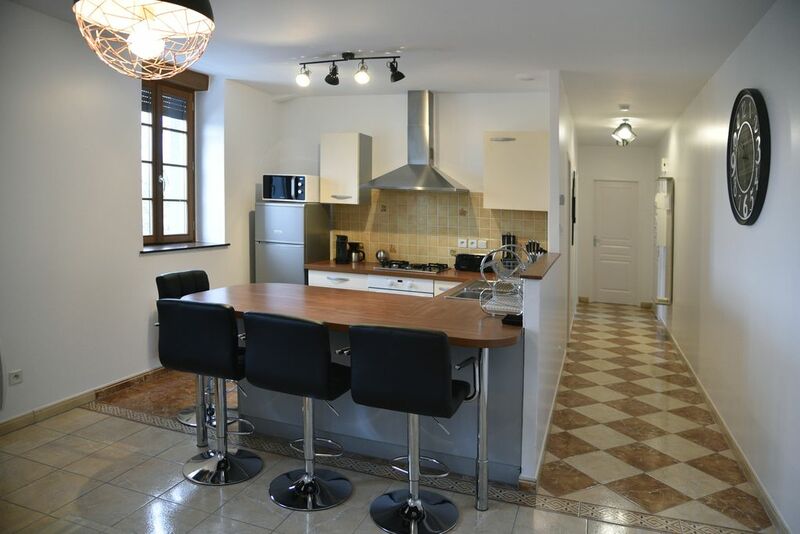 I am a warm apartment at the foot of the Therme at LUXEUIL LES BAINS, located on the top floor of the Old Casino. My private parking space, my intercom and my digicode are real assets both safe and practical. An elevator will take you to the 2nd floor, a small staircase to climb and you are in paradise, combining old and new, all the elements are there to make your stay a success. All the conveniences of use are accessible on foot: (Bakeries, butchers, Carrefour Contact, restaurants, downtown). - Equipped kitchen: fridge freezer, microwave, oven, kettle, toaster, SENSEO Switch (duet coffee or pod), friendly worktop. -Living room with sofa, coffee table, LED TV, micro channel and wifi. -A large pantry with shelves, bagless vacuum cleaner, cleaning kit, drying rack, iron and ironing board. All windows overlook the Thermes. If you have any questions do not hesitate to contact my owners Sandrine and Stéphane. Weekly rental only (according to availability during the period from the beginning of March to the end of October). Rental from early November to late February, contact us.